ViA Card a better way ! ViA Card is a Pre-Paid-Cash Card but so much more than 'just' a card to use for payments. A new ViA Card planed to be launched in Thailand during first quarter of 2015. The ViA Card will be the first of its kind as a Pre-Paid-Cash Card and open up a new dimension of users in the society. 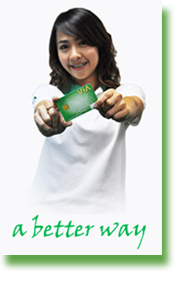 The ViA Card will also be issued as a co-branded card with different traditional card brand such as Visa and Master Card. 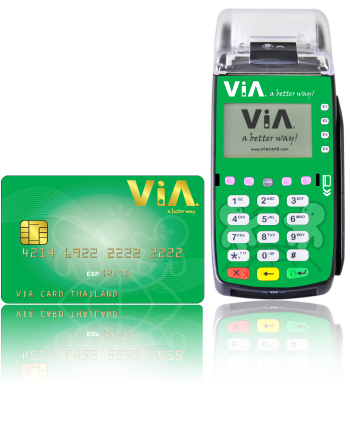 ViA Card is beyond a card-brand also the corporate name for the operation in Thailand ViA Card (Thailand) Co Ltd as well as a registered trade/service mark, which you can read more about. ViA Card and the ViA Model serves all peoples interest, from consumers, merchants, small family corporations, SME's, distributors, suppliers and last but not least important also governments, here you can read more. ViA Card is built upon the Business Model Innovation and the Financial Model Innovation the groups founder, Lars Olof Kanngard finalized the base for back in 2005 and fine-tuned 2006, at the time when ViA was conceived. The first Business Model Innovation which is built from inside of the unbanked consumers and merchants around the world. A true payment revolotionary innovation. 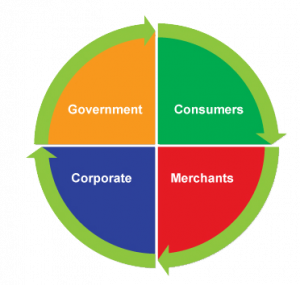 You will here find all the information you need as a Consumers, Merchants, Corporations and or a Government. You can click on the section you like to read and look more at. What is a business model and Financial model Innovation? "Business model innovation is typically an ad hoc process, lacking any framework for exploring opportunities. As a result, many companies miss out on inexpensive ways to radically improve their profitability and productivity. The Solution." stated by HBR Harvard Business Review. There is little written about Business and Financial Model Innovations, so to learn more you may find interesting reading on our dedicated website for Business and Financial Model Innovation. On our own website you will learn and see how you can create business model innovations, not only read about what others did, which is in the case in documents we have found. ViA Card is a PRE-PAID CASH CARD which means that what ever amount you want to spend, needs first to have been deposited in your ViA Account. No middleman, No extra cost a financial solutions for the people! ViA Card will offer in Thailand more than one type of card. ViA Card will offer different products targeting different users group. What is important to state is that VIA Card is a neutral brand an 'inhouse' brand developed for the merchants and for the consumers, while traditional card-brand are made as products for the banks. A ViA Cash Card is not an e-money card, it is a card equal to a normal ATM card. If the ViA Card also carries a Co-branding logo of Visa or MasterCard or any other card-brand ViA Card may work with, such card-brands privileges also apply and or the ViA Card can be used anywhere where also such brand can be used. The ViA Card if it is a co-branded with any major brand, like the sample you can see here to the right, that ViA Co-branded Card will work as an example anywhere in the worlds where Visa is accepted. If the ViA Cash Card is without any other logo of a major brand, you can use the ViA Cash Card anywhere where you can see the ViA PAY sticker, or go to our Merchant Location Map and find the ViA Merchant near you. You can Top-Up your ViA Cash Card at any ATM machine, but preferable at any ViA Merchants, where you can see the sticker ViA PAY. If you are employed you can preferable ask your Employee to pay your salary directly to your ViA Account. The benefits to use a ViA Card is many, first of all; if you lose cash in the pocket, you lose them and will likely not get it back. If you lose a ViA Card, your values are still intact. As the number of ViA Card grow, both in Thailand and in the world, you as the card-holder and consumer becomes part of a larger value being part of a user community. When the ViA Community expands ViA plans to operate a few more companies to commercializes the knowledge from what you and I do when we use a ViA Card. If you have accepted to precipitated, you will also get values back as ViA can earn on such knowledge (Data Mining). ViA Card will mainly use its own PLUS COUNT concept which gives the customer the card holder more value to spend. The very good thing with a ViA Card is that you are a registered user, we know who you are and whatever happen your card, it gets stolen or you lose the ViA card, we can always quickly replace your card as well as we can help you to get ViA Quick-Cash if you are 'stranded' and need cash very quickly. The ViA Card operates under the supervision of Bank of Thailand (BOT) and your deposits is managed by ordinary Thai Banks in so called Custodian Pool Accounts. Custodian account means that the depositor is the owner of the funds and ViA Card can only use revenues from selling services, products and from fees charged to a customer.